I have written about this subject in this blog but felt more of my readers should know about it. 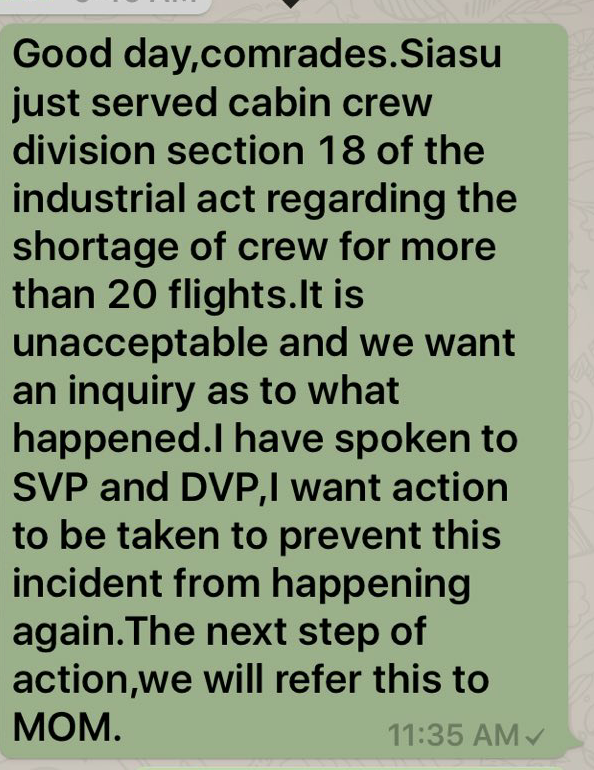 This is a serious matter as more than 20 recent flights left without the sufficient number of cabin crew. What this means is that the operating crew has to work extra hard for nothing because the absentees were either on medical leave or some other reasons. There is no replacement of the absent crew. The service on board and safety of passengers (in the case of emergency) will inevitably be affected. This message was circulated to the crew by the union. 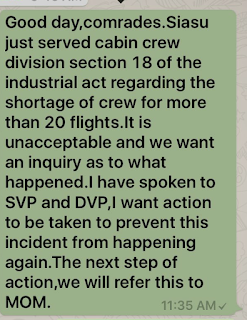 Section 18 of the industrial act means the cabin crew management has to sit down and discuss with the union as well as take remedial action to solve this problem. If the management does not want to discuss or do something positive, the matter will be referred to the Ministry of Manpower which will then decide on the next form of action. Managers know all about this. As long as all staff are in the dark, its normal operations. MOM step in liao so what? Tekan you all very easy 1. Increase work load n increase air fare to defray cost or alternatively cut down your existing benefits to cut cost. With the increase in crew, all of you will be put on more standbys whereby you wont get call up cos now excess crew liao ma. You think employer is new? They have been in business for more than 50 years..
they know all the lobangs. Employees are the ghundu ones.